Ricardo was born into a large, talented musical Hispanic family, which had settled in Scottsdale, Arizona. Ricardo shares with Christianmusic.com, "I'm the youngest of five boys and one girl, a mom and dad, and a dog named Buffy. We lived in a two bedroom home, and you guessed it, my sister got her own room and 5 boys were in the one room." From a really early age, young Ricardo was influenced and exposed to family music sessions, both in Spanish and English. Ricardo's father and the uncles would play and make music together, which of course fed Ricardo's natural musical talent. 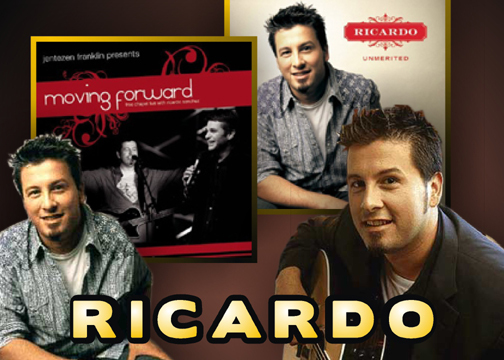 Ricardo shares with Christianmusic.com about his early musical experiences and how his desire to perform music was influenced strongly by his father. "My dad, Vincent Sanchez, always wanted to be a 'famous' Mexican singer. So growing up, my earliest memories were of him and my uncles playing and singing. I guess it created a passion within me." Also, during his preschool years, he grew up listening to his siblings' singing group, consisting of one of his brothers and his sister, singing with his dad Vincent Sanchez, in lovely 3 part harmony, singing traditional mariachi music. Ricardo joined his siblings in song at the ripe old age of 5, much to his excitement. As the Los Hermanitos Sanchez, the three Sanchez children, accompanied by their father on guitar, sang at festivals and community events in and around Phoenix. As their popularity gradually grew, they were able to hire full mariachi bands to provide musical accompaniment. Their father evolved from being their guitar player to their talent booking agent and a self-employed entrepreneur as well, a business which he developed to help other artists as well. Los Hermanitos Sandchez continued to perform as a group until Ricardo entered high school, when everyone became involved with their own families and lives. While Ricardo's family were all members of a local Catholic church, the family wasn't active in Christianity or involved with this church family, except young Ricardo, who would walk by himself a mile to the church to participate in services. Encouraged by the priest and the kind people, Ricardo attended services from childhood through his young teen years. In a bio found on his web-site, Ricardo explains this need he felt early in his life for the Lord. "I just felt the presence of God in my life, but I didn't know what it was. I didn't know how to explain it. I just knew God was real, and something in me yearned for Him." Though the people he worshipped with and the parish priest at this local church encouraged him to continue to come and experience a caring church family, Ricardo continues to explain why his church experience didn't help him draw closer to God. "The church never taught me to pursue Jesus on my own. You were expected to depend on the priest for that, so I had no understanding of who I was in God, or what heaven was." (As a child,) "I just knew Jesus was hanging up there on that cross, and I was supposed to fear God, and go to confession, and that was about it." Ricardo entered high school with his passion for music, and his love for God intact, though still yearning for a closer relationship with the Lord, but not fully realizing it on a conscious level. As a freshman, Ricardo was invited to join a national Christian outreach organization, YOUNG LIFE by a childhood friend, *(Craig - see below). Ricardo spent his high school years actively involved in this valuable Christian youth club, where not only did his passion for music grow, but also he had the opportunity for the first time in his young life to learn about God's Word, realizing through Bible study, that his longtime yearning was a real need for closeness with the Lord. It all came together for Ricardo at a YOUNG LIFE retreat during his junior year in high school. Ricardo explains this important turning point in his life. (Bio on his web-site:) Ricardo comments, "I thought I knew everything about Christianity already, until I went to a YOUNG LIFE retreat in my junior year. They walked us through all the Gospels the first night. Then, the next night they talked about sin, and about Christ dying to pay for our sins. I had never made that correlation, and when I suddenly did, it literally rocked my world." This dramatic realization put Ricardo on a new path, coming closer to the Lord. (Bio on his web-site:) Ricardo explains, "It started to become clear to me that I hadn't turned all of me over to Christ, and that I had to have Him in my heart. By nest summer's retreat, when they asked if anyone wanted to receive Christ as their personal Savior, I raised my hand, and gave my life to Him, and it completely transformed everything." * This transformation was the beginning of Ricardo's music ministry for Jesus. Ricardo shares with ChristianMusic.com about how he was led to write and sing for Jesus, inspired by his life experiences (good and bad) and the Holy Spirit, going into more detail about the friend who invited him to Young LIFE in the first place. "It all began with my salvation process. The first Christian song that I wrote was called 'Craig and I.' Craig was a childhood friend of mine that invited me to Young Life club. Well, 4 years later, I accepted Christ and Craig didn't. So I wrote a song about it." With his spiritual mentor being Jesus, Ricardo began to develop a personal relationship with Jesus in earnest, as he continued on with his spiritual journey, now learning step by step to use all his gifts, his love for Jesus with his considerable musical talent to be in ministry for Jesus. (Bio on his web-site:) Ricardo shares, "Now I'm mostly influenced by my everyday relationship with Christ, including if I'm in the drive-thru at Wendy's or if I'm ministering in my Sunday School Class 'Kingdom Living.' Sometimes I'll hear/feel God speaking something to me. That's how I wrote my first radio single 'I Call Your Name.'" The Lord is Faithful.....Further Opportunities for Ricardo to develop his musical and spiritual gifts. After graduating from high school, Ricardo supported himself doing a variety of temp jobs, while further developing his musical gifts in composition, lyrical development and singing, by playing in various Christian bands around the Scottsdale community, for the next 5 years. Ricardo was led by the Holy Spirit to become member of an independent, non-denominational evangelical church, where he met Israel Houghtan, a gifted worship leader, who was a guest vocalist who was performing for services. Ricardo and Israel developed an important, endearing "personal and creative bond," and began to compose songs together and did tours together, in-between everything else. More opportunities for growth materialized for Ricardo through touring with Israel Houghtan's Band, whose music became popular, landing Israel a contract with a record company in Tennessee; No small feat for an independent performer. In between tours with Israel's band, Ricardo went on to become youth pastor at another Scottsdale church. Ricardo eventually was offered a position at a Chicago church as music director and youth pastor through one of Israel's gigs. Ricardo was there from '96 - '98. During a tour with Israel's Band, Ricardo met the love of his life, Jennette Stewart, at a Provo, Utah concert. They began a long-distance relationship, and eventually married at the end of '98, after Ricardo took a sabbatical at his friend Israel's house in Tennessee. Ricardo felt the need to spend some time praying and being in thought /meditation to discern what God's will was for him at this time in his life. The Lord continued to open doors of opportunity for Ricardo. By continuing to tour with Israel Houghtan's Band, ever more popular, Ricardo's talents were discovered by other churches and evangelists who hired Ricardo as a guest soloist and worship leader. Ricardo was then offered a position as music director in a Kansas City church, which eventually led to another offer to be a youth pastor and worship leader in a large Houston church. In 2000, Ricardo and his wife Jennette eventually found themselves back in Scottsdale near family, with Ricardo becoming the youth pastor and co-worship leader with Israel Houghtan at a new, fast-growing church, The Scottsdale First Assembly Dream Center. In 2001, Israel Houghtan left to be in a Houston church, and Ricardo became the minister of music and full-time worship leader, where he still ministers and leads worship in music today. (Bio on his web-site:) Ricardo shares, "I feel really settled in my spirit that I'm where the Lord wants me to be. I love talking to people and discipling them. And I love playing and singing, and leading worship." His new album, UNMERITED, is a collection of his own Praise and Worship songs (2004), two of which were created with the help of his friend, Israel Houghtan (also in 2004), and tested with groups of people whom Ricardo had led in worship in his present church. STAND STRONG was written by Greg Forney (2004) who must be pleased with the way Ricardo performs it on this CD. A Spanish version of UNMERITED will be released to minister to the large Hispanic population, in his community and at large. (Bio on his web-site:) Ricardo explains, "I really have a heart for the Hispanic community. So much of that culture is very wrapped up in religion, but without a real, saving knowledge of who Jesus really is -just like I was. If I could carry that message to them, and anybody who is in a place like that, it would be a great thing." A Christian music composer / songwriter's songs are a result of a variety of influences he or she experiences throughout his or her life, as well as through the promptings of the Holy Spirit. While he had one foot firmly planted in his Hispanic family musical roots, Ricardo had his other foot firmly planted in American rock. Throughout his high school years, Ricardo sang and played bass in several garage bands. He began composing songs in his teen years as well. Ricardo enjoyed and appreciated top 40 rock bands such as Aerosmith, Bon Jovi, Richard Marx, Def Leppard, The Beatles and other 'hyper-hooky' rock acts, which attracted the younger generation at that time. Looking back, Ricardo shares with Christianmusic.com his favorite musical influences: "Steve Wonder, Earth Wind & Fire, Aerosmith, Steven Curtis Chapman, Mike W. Smith and Amy Grant." Various elements from his musical influences from a variety of genres: Hispanic, Rock, Acoustic and Christian contemporary have helped to shape his own wonderfully creative musical style, much to the enjoyment and blessing of the listener! The listener will enjoy an infectious, bright, uplifting collection of Praise and Worship songs, ranging from enthusiastic Praise songs with a kick to them, to heartfelt, poignant Worship and Prayer Hymns, which all together create a wonderful CD aimed at not only young people but the young at heart of any age. It is very refreshing to hear such a wonderful blend of acoustic rock, Christian contemporary and Latin influences, which translate into songs with melodies that are interesting, catchy and memorable, and inspire praise and worship from the listener, and from any contemporary music worship session, camp program or church worship service. The song compositions are acoustic-based, with inspired support from piano, keys, electric guitars, some horns, some Latin rhythms & themes, some light violin dubs and well-played, lively drums, which keep the song tempos moving but doesn't overwhelm the wonderful musical combinations which showcase Ricardo's musical gifts in composing and performing. ChristianMusic.com had to know. "Do you compose from Key board or guitar?" Ricardo answers, "It depends where I am. Track three on the CD, "The name of Jesus," was written on the drums. I just locked the melody in my head and ran to my guitar. A few days later I had a visit with Israel Houghton and we finished the tune together." While produced to have a sound popular on Christian radio, it is not overdone / overwhelming;(which is a pet peeve of this reviewer!). The producers did an excellent job in providing the listener with a well-balanced, mixed sound track, allowing the acoustic and hispanic flavor, and delicate inner voices to shine. One can enjoy the guitar work, and musical support provided by instruments found in acoustic rock bands, as well as enjoy the lovely piano accompaniment / guitar work on the Ballads and Prayer Hymns. The inspiring melodies of the songs are catchy, infectious and memorable; Lyrics are direct, to the point in bringing the song's message very effectively to the listener; and the lyrics in the chorus are nicely put together, easy to remember and would be easily learned by the audience in group worship. The most inspiring, powerful vehicle found in these songs are Ricardo's spirit-filled vocals!!! Ricardo's vocals are truly special. Besides his wonderful, expressive voice and clear diction, the most appealing quality of his vocals is how Ricardo's spiritual honesty and love for the Lord shines through his songs. 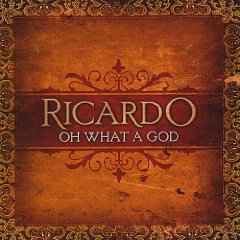 Ricardo's faith and dedication to Jesus as expressed in these inspiring songs will surely bless the listener most of all. The cherry on top for this reviewer was the way Ricardo ended this inspired musical effort, UNMERITED. The last cut, #13, was Ricardo's accappella, heartfelt rendition of the classic hymn, IT IS WELL WITH MY SOUL, by Horatio Spafford and Philip Bliss, originally composed in 1876, listed in church hymnals under the hymn category, "Justifying Grace." What an appropriate song to end an album inspired by Ephesians 2! WOW! What an album! UNMERITED is a MUST for any youth music program in any denomination, is a must get valuable resource for contemporary Praise and Worship and is a wonderful addition to your Christian music collection. Many themes of the songs explore the 2nd chapter of Ephesians. The heart of this chapter can be found in Ephesians 2:4-10, which explains the concept of unmerited grace, which inspired the album's title, UNMERITED. 8-9 For it is by grace you have been saved, through faith, and this not from yourselves, it is the gift of God, not by works, so that no one can boast. 10 For we are God's workmanship, created in Jesus Christ to do good works, which God prepared in advance for us to do. CD begins with a bang, with this strong Praise and Worship song, sure to be a favorite with congregations, especially youth! Snappy drum intro in the first 2 measures sets the light, upbeat tempo and mood, which is picked up by sharp electric guitar / acoustic dotted note rhythm / counter melody which cooks right along, supporting the strong vocals and melody. Nice touches of synthesizer, especially in the Bridge. The musical segues into and out of Bridge were also well done. Chorus: to come down right now, and fill this place, reveal You’re will, unveil Your face, we need the touch of Your embrace. Right now my Lord come down, come down! Favorite Worship song of this reviewer. Written in a minor key, moving Latin rhythm and melody influences are prevalent in this upbeat, joyful Prayer Hymn, done Ricardo style - Most enjoyable! Intro starts with acoustic intro & duet with keys? in first two measures, where the Latin ensemble of horns, guitars, percussion jump into offer strong counter melody, interesting Latin embellishments and guitar riffs, with some syncopation thrown in for good measure! Terrific support for the inspired vocals. Wow! what a song to lift the spirits, sure to knock depression and discouragement or a sour mood out the window! Strong favorite of this reviewer! Praise song which really cooks! Has an infectious beat, melody and a joy which is propelled by a sharp guitar ensemble, energetic drums and enthusiastic vocals - a sure hit with young people and the young at heart! A great song to inspire thanksgiving and praise by the listener. Great match of composition with simple yet effective lyrics, which makes this song perfect for group worship! Hallelujah! hallelujah to the Lord, our God! Hallelujah! hallelujah to the Lord! our God! Emmanuel, God with us, wonderful counselor Jesus! Chorus: the name of Jesus is greater, than any other name, the name of Jesus every tongue on earth will now proclaim, the name of Jesus there’s no other name above the name of Jesus, the name of Jesus! Hook: No other name greater! Than the name of Jesus! Third favorite Worship song of this reviewer. Lovely Worship Hymn song, which would find a home in both contemporary and traditional worship service. Composition has mainly acoustic guitar ensemble and piano accompaniment, to support the poignant, dynamic vocals which touches the heart and uplifts the spirit in worship. Dynamics are used effectively, starting softly and building throughout the song, to the Chorus after the second verse. Vocal harmonies add sparkle in the chorus and second verse. Fourth favorite worship song of this reviewer. A strong rock beat gives a steady momentum to this peppy, Latin-flavored Praise and Worship song. Composition features acoustic /electric guitar counter melody/ broken chords, with other voices like horns, synthesizer? bass electric guitar support with a healthy dose of Latin rhythms and musical influences come together to present a delightful bicultural Praise and Worship song, the perfect vehicle for the blend of English and Spanish in the vocals. Very good use of dynamics throughout the song. A rock-style Prayer Hymn which reminds the listener that when we obey the Lord doing His will for our lives, the Lord always comes along to empower and help us in our thinking and our efforts, leading the way. Another interesting melody put together with meaningful lyrics. Composition features very nice, sharp guitar work (both acoustic & electric), during the verses with a synthsizer blend as the bottom support in the chorus. Again the vocals are most enjoyable and effective in carrying the spirit and meaning of the song. Hook: No mountains too high no valleys too low, NO. NO, NO! no rivers too wide as long as your by my side oh Jesus! 2nd favorite Worship song of this reviewer. Written in 3/4 meter, song floats along with a lovely blend of synthesizer, piano, guitars which all offers a musical composition which is perfect for the strong main vocals and beautiful backup full harmonies! One can't help but join in at the chorus! Lovely are your dwelling places, nothing could ever replace it. I’m free from what I was facing, eternity without Thee. Your love called me from a darkness, then set my feet up on a rock, Lord. And now I never will depart from eternity, you and me. Favorite Praise rock song of this reviewer. Another great, full rock praise song, with plenty of energy and zip, which supports an incredibly infectious melody and vocals which altogether is highly motivating, and is aimed at the hearts of the youth of any congregation and the young at heart! This song is hard to resist; it will most probably get the listener dancing around the room in praise and thanksgiving! Composition has a driving rock beat, moving guitar work (both melody and counter melody & rhythm) plus other embellishments which all fit tightly into the rock beat & rhythm and cooks mightily along! Chorus: Thank you, thank you, Jesus, Jesus you covered our sin and established our freedom. Thank you, thank you Jesus Jesus, we lift our voice and give thanks to you Jesus. I wanna say thank you thank you yeah yeah yeah creation sings of your glory the hills proclaim of your majesty. We lift our voice to you mighty king, awesome is your name in all the earth. The heavens speak, of your righteousness. The people sing, oh how we’ve been blessed. We exalt your name, above all the rest awesome is your name in all the earth. Bridge: We want to say thank you thank you, yeah yeah yeah! Tag: Lord we boast of your mighty works with your voice you created the universe. We won’t stop till all have heard, awesome is your name in all the earth!!!!!!! Chorus: Thank you, thank you, Jesus, Jesus you covered our sin and established our freedom. Thank you, thank you Jesus Jesus! We lift our voice and give thanks to you Jesus. A strong favorite of the reviewer. This Worship Anthem would do well in both contemporary and traditional services. Composition has a very nice, memorable melody carried by an inspiring blend of guitars, piano, synthesizer work, nice backup vocals which support nicely the strong main vocals by Ricardo. Nice second melody which complements the vocals and message is found in the Bridge. Child of God, redeemed and forgiven, never forget the power of your position. Cause in these evil days in a realm not of flesh and blood a battle is waged. Child of God put your armor on! Child of God, citizen of heaven. There will be no applause, from this world which you live in. Cause the spirit of this age, opposes all the things of God. A battle is waged child of God put your armor on. Another a peppy, fun, Praise song with a rock beat, perfect for youth worship. The chorus will be a big hit with youth! Composition features a rock beat, fast moving, impressive guitar work, with additions of synthesizer & electric guitar support. There’s no greater name than the name of our God, there’s no better way than the way of our Lord. Oh how good it is to sing of his greatness! oh He’s the King of kings and the Lord of lords, my fathers loveliness is beyond words, oh how good it is to sing of his greatness, oh, oh, oh oh! Bridge: Lord we rest in the knowledge that you are good, despite your enemies plans, You have always stood you’re the King of creation and Lord of all. Hear our hearts when we say. We love you Jesus!!!! Chorus 2: Make a joyful sound, come on and praise him now! Lift your voice and shout, WE LOVE YOU JESUS! There’s no greater name he always stays the same let all the earth proclaim, WE LOVE YOU JESUS! Another strong favorite of this reviewer. A lovely Worship Prayer Hymn that touches the soul and inspires the spirit. Another song which should be at home at both contemporary and traditional services. A beautiful combination of acoustic guitar, electric guitar background support, piano, string dubs and synthesizer (lightly applied), dynamically played creating an inspiring, memorable melody, another perfect vehicle for the poignant, heartfelt vocals and message, which moves the listener to worship as well. So many times you’ve been there for me, been there for me! And I’ve realized there is none like you. I’ve made up my mind there is no one for me, no one for me, who speaks in my life the things that you do. Another inspired Prayer Hymn which would be appreciated in both contemporary and traditional services. Composition consists of a lovely dynamic, full piano accompaniment which complements the strong, expressive vocals sung so effectively by Ricardo. The song washes over the listener with its beautiful sound and comforting message about what a wonderful, loving Savior and friend we have in Jesus Christ who rescues us, heals us and changes our hearts, showing us mercy that we don't deserve, and restores us in ways we can't imagine! Here I am, once again, I’m not gonna’ return, to where I’ve been. May I rest, in this place, captured by your words, healed with your embrace. Horatio Spafford wrote this song after suffering a terrible series of losses; lost wealth, a son from illness, and 4 daughters in a ship wreck in which only his wife survived. Despite all these devastating losses, he remained strong in his faith. (See the full story) "His worship does not solely depend on how he feels. 'Whatever my lot', He says, 'Come rain or shine, pleasure or pain, success or failure, Thou hast taught me to say / It is well, it is well with my soul'." Ricardo chose the perfect Worship Hymn to end his album, which he has no trouble singing alone with no musical accompaniment, giving the listener a soulful, heartfelt rendition of Spafford's song of faith and trust in the Lord, not matter what travesty befalls our lives. Refrain: It is well, with my soul. It is well, it is well with my soul. 4) And the Lord, haste the day when my faith shall be as sight, the clouds be rolled back as a scroll; the trump shall resound, and the Lord shall descend, even so, it is well with my soul. Ricardo with host Monica Schmelter on "Bridges"